Santrock – connecting research and results! As a master teacher, Santrock connects students to current research and real world application. His integrated, personalized learning program gives students the insight they need to study smarter and improve performance. Connect with Life-Span Development and connect with success! 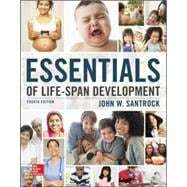 Essentials of Life-Span Development 4e was developed to help meet the ever-changing needs of students in the lifespan course. Research shows that students today learn in multiple modalities. Not only do their work preferences tend to be more visual and more interactive, but their reading and study sessions often occur in short bursts. With shorter chapters and the LearnSmart interactive study modules in Connect Lifespan, Essentials of Life-Span Development allows students to study whenever, wherever, and however they choose. LearnSmart helps ensure that your students read and appreciate the material while McGraw-Hill’s Milestones video series helps bring the course material to life, so your students can witness real children achieving their developmental milestones. Regardless of individual study habits, preparation, and approaches to the course, Essentials connects with students on a personal, individual basis and provides a road map for success in the course.